Cloud computing had been deemed ‘The way of the future’ for a long time. For growing small businesses with an ever-increasing demand for IT software, this statement is becoming more and more relevant by the day. With limited resources available and demand online growing, on-premise software is becoming dated and is struggling to cope with the scalability of successful small businesses. Where software lacks, manpower of employees is needed to fill in the gaps. With the help of cloud software, there are endless possibilities of what can be done. Cloud software solutions allow small businesses to successfully reduce manpower devoted towards IT. One of the main, obvious key points of cloud is the endless customisation possibilities you have available for you. For example, Sage Financials (Cloud Accounting software) can be integrated with 1000’s of applications from the Salesforce AppExchange, yes… 1000’s! This gives you the ability to completely customise your system, automate processes and much more. For smaller businesses, this is absolutely ideal as it gives your team the freedom to focus on what they do best. 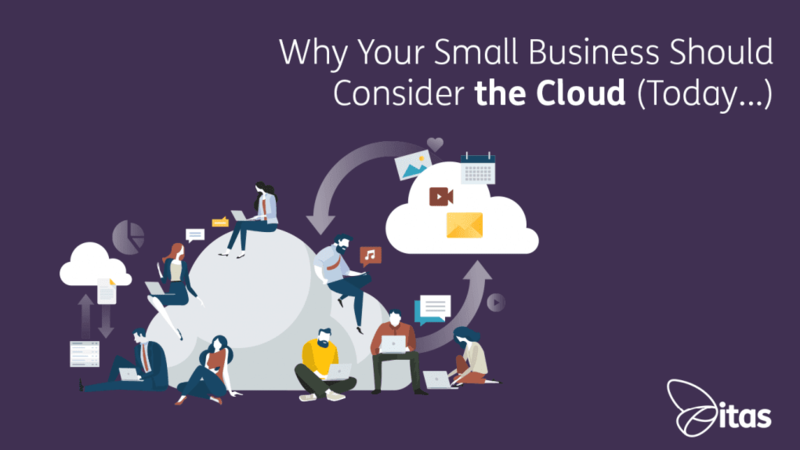 In comparison to smaller businesses that use on-premise solutions, businesses using cloud solutions can find scaling up a lot more manageable and a faster process. On-premise software scalability can devote much more time and money than necessary. Using the cloud simplifies this because all of data is stored online. All the data is easily accessible wherever you are in the world, and is available to view on a range of different devices. Scaling your software up becomes more speedy process in comparison to those businesses that don’t use cloud, their hardware becomes bogged down with the growing demand of the business. One of clouds many great advantages is that it’s highly accessible. It can be used and accessed anywhere, anytime and anyplace. All without adding any extra software/hardware to the system. This allows businesses to access accounts, costings and any other important information with just access to the internet. Imagine a salesperson on-site with a client, taking orders and from their mobile device which instantly updates your accounting system automatically. That alone would completely revolutionise so many businesses. Unlike on-premise software, cloud solutions update automatically. Due to it acting like an off-site server, it is always up to date. This helps smaller businesses hugely, as less maintenance is required on the software. This allows the focus to be elsewhere on more important matters at hand, where as other on-premise businesses devote more time to dealing with software updates/issues. This can use up unnecessary expenses that smaller businesses would find useful elsewhere. Sage Financials, based on the Salesforce Platform, is the lead product is Sage Business Cloud. Salesforce is one of the worlds biggest CRM platforms. Sage Financials gives you the opportunity to bring your accounting package onto the same platform and streamline your business. Sage Business Cloud will help you spend less time on admin and more on attracting customers. To find out more about Sage Financials or the Business Cloud, check out our blog or give one of the team a call. Gain visibility into your financial and business performance, view precise reports across departments and manage your entire business from any connected device. The cloud is quick, easy and don’t forget, powerful. With 627,000 new small businesses opening each year, now is the time to re-evaluate current systems. Are you getting the most out of your accounting solution? Click here to read all about Sage Financials and it’s incredible cloud-based system.